The lodges on the private game reserves around Port Elizabeth doesn't just dish up the most amazing game sightings, but also some of the most delectable foods you can imagine. Best of all is that non two are the same. 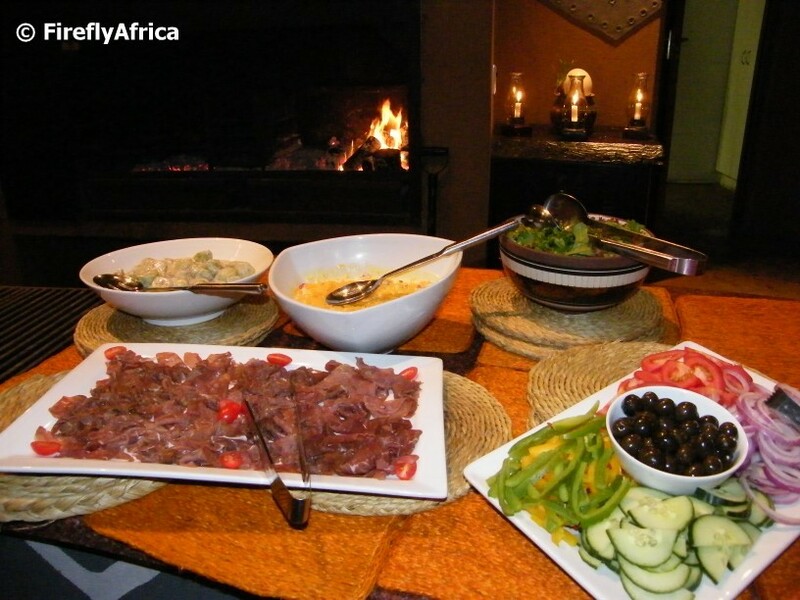 Visitors are treated to royal meals three times a day with high teas and sundowner game drive snacks in between as well. This was part of the starters we had on a visit to Pumba Game Reserve a little while ago. Springbok carpaccio with all the trimmings that go along with it. 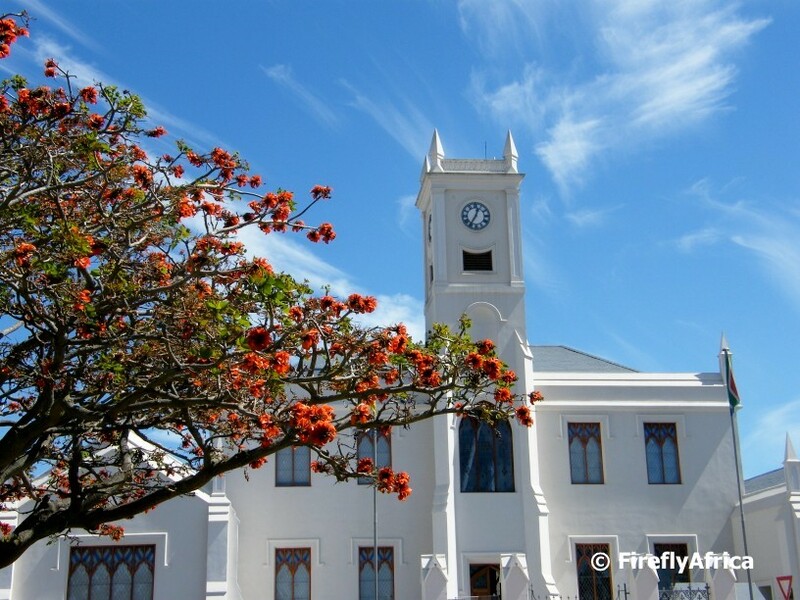 The Coral Trees around the city is starting to don its flower gown and the Grey Institude makes for a nice background behind this one on the Donkin Reserve. The old St Mary's Cemetery is situated between South End and the city centre close to where the Baakens River flows into the Port Elizabeth Harbour. 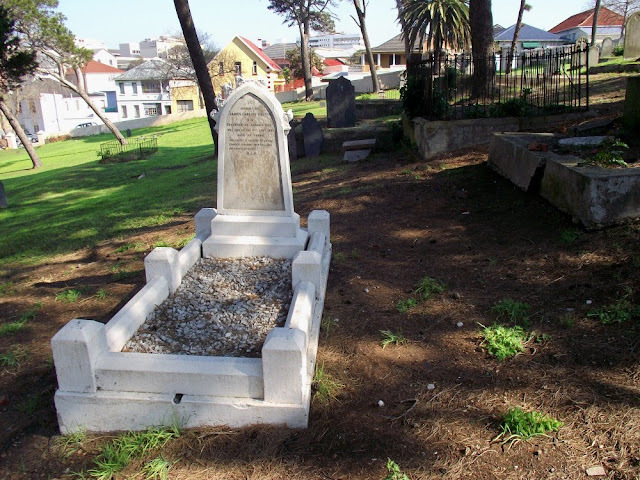 Some of the graves date back to the mid 1800's and include some of the original British Settlers who arrived on our shores in 1820. 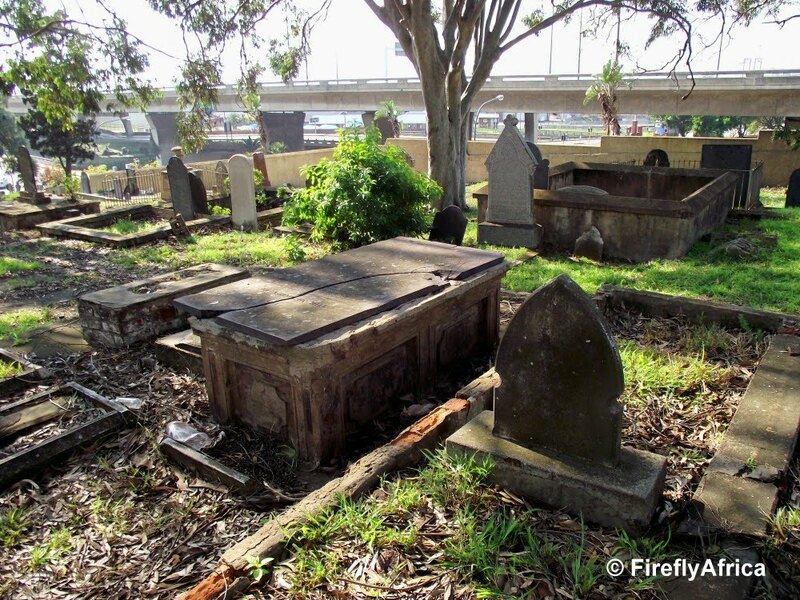 For a couple more of my pictures of the cemetery, visit The Firefly Photo Files here and here. The bridge in the background is part of the Settlers Freeway. One of the pools on the Maitland River at Sleepy Hollow west of Port Elizabeth. 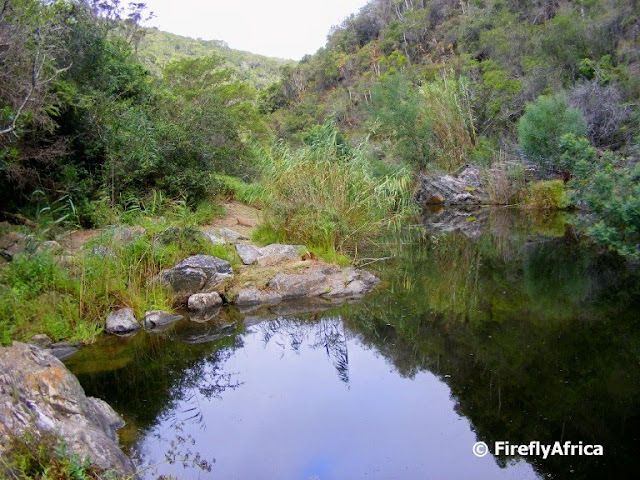 In summer a lot of the campers like to cool off in these pools which is situated up the valley from the campsite. One of the slightly unusual sights outside the Port Elizabeth Airport is an Impala MkI sitting on top of a pillar next to Aviators Pub and Grill. It kinda looks like a scene from a SciFi movie with a spaceship docked at a space diner. 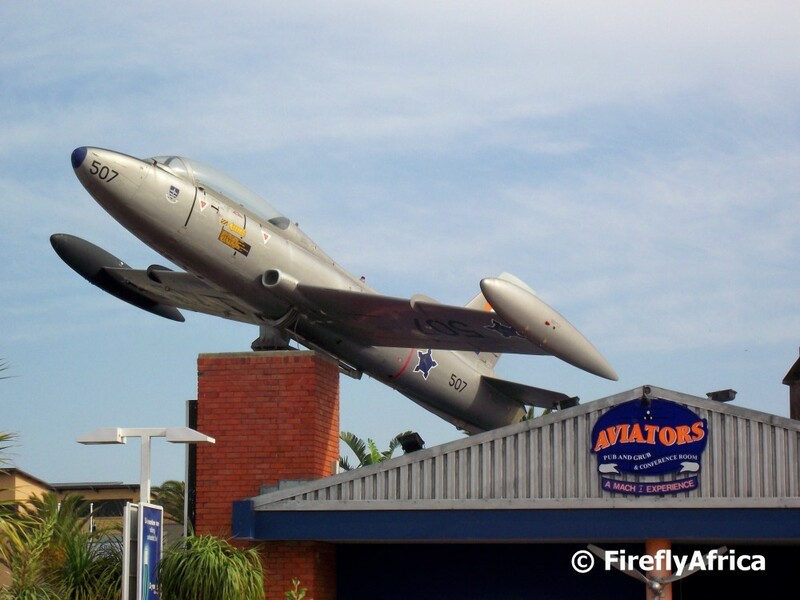 The Impalas were used as training aircraft by the SA Airforce in the past and this one got a prime spot to retire at. For more pictures from cameras pointing upwards, visit Skywatch. 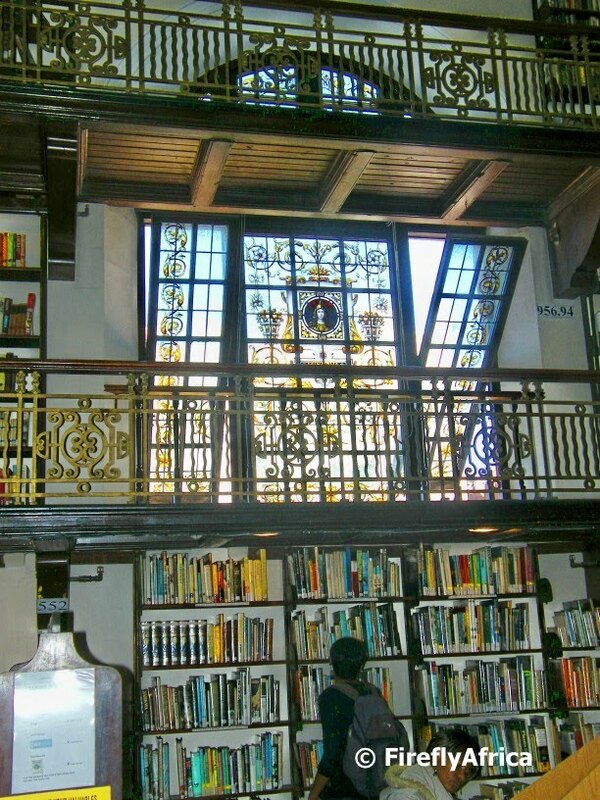 One of the magnificent stained glass windows visitors can see in the historic Public Library in Port Elizabeth's city centre. The library has several of these windows which include a stunning stained glass dome over the centre of the library. 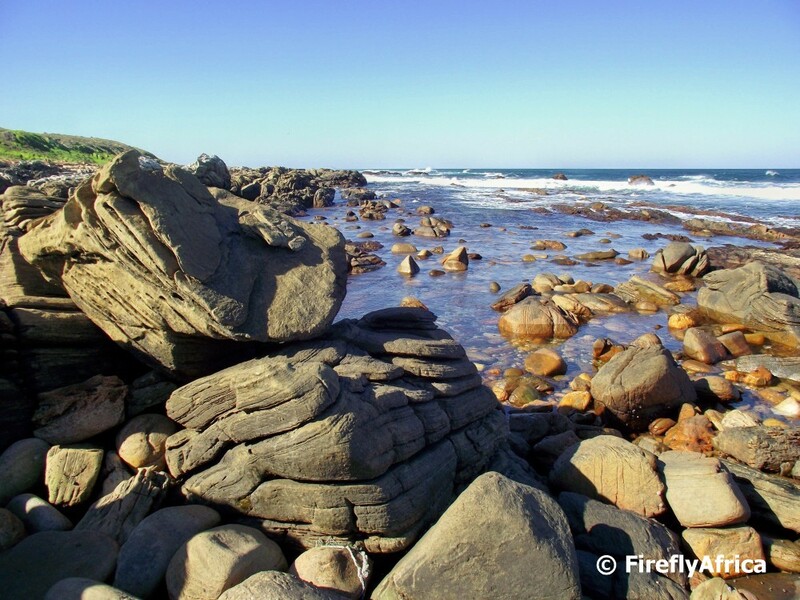 The rocky coastline at Schoenmakerskop. 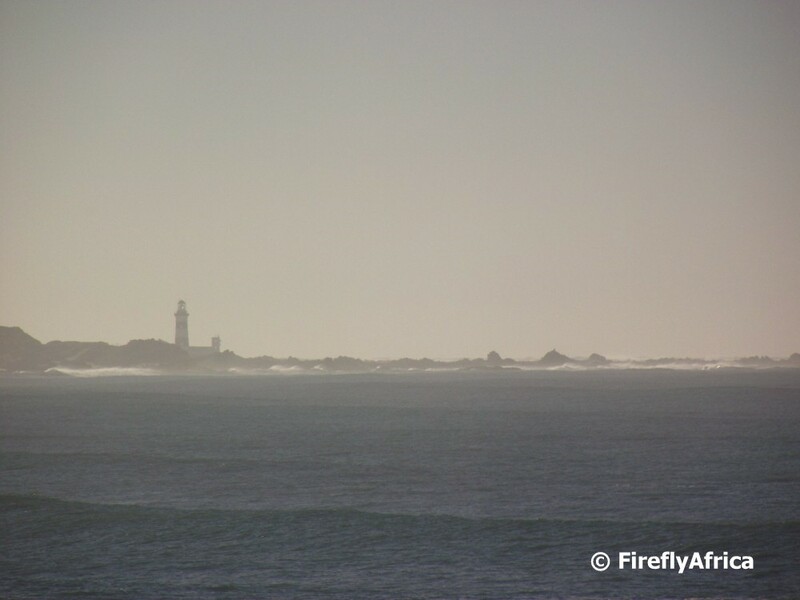 The coastline from Cape Recife through to Schoenies is generally known as the Wildside and looking at the rocky coast and how rough the sea can get there, its possible to see why. Driving down Russell Road towards town, the Russell Road Cemetery is situated on the left hand side. On the hillside in amongst what is left of the grave sites there is one that stands out clearly because of the fact that it is painted white. 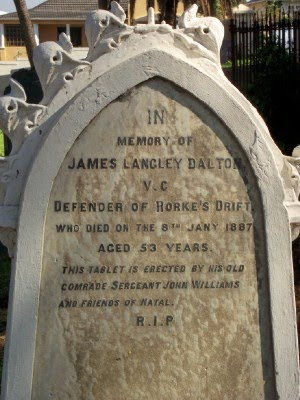 The grave belongs to James Langley Dalton. 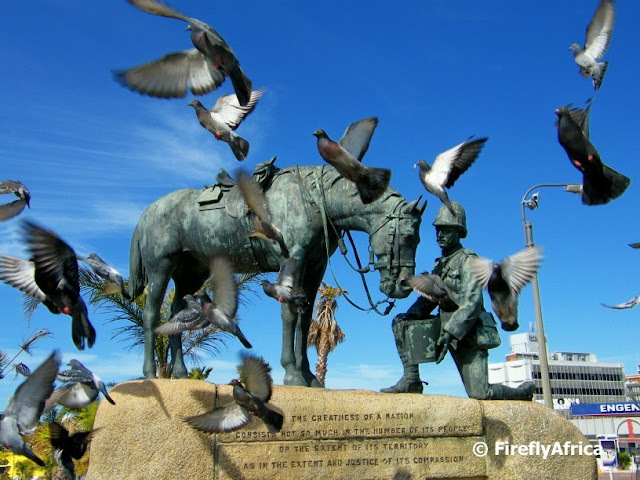 Dalton was a survivor of the Battle of Rorkes Drift and the recipient of a Victoria Cross. The battle at Rorke's Drift took place from 22 to 23 January 1879. 139 British soldiers defended a supply station against about 4 500 Zulu warriors with about 500 Zulus dying in the battle and only 17 of the defenders being killed. The remarkable fact about Rorkes Drift was that 11 Victoria Crosses were awarded after the battle – the highest number ever awarded to a regiment for one action. If you are interested in more information on Rorkes Drift or James Dalton, visit rorkesdriftvc.com. 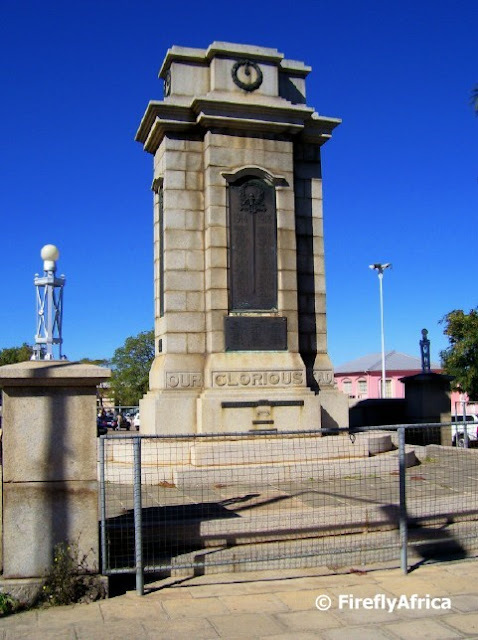 Standing in front of the Uitenhage town hall is this war memorial erected in rememberence of the men from the town who died during the two World Wars. 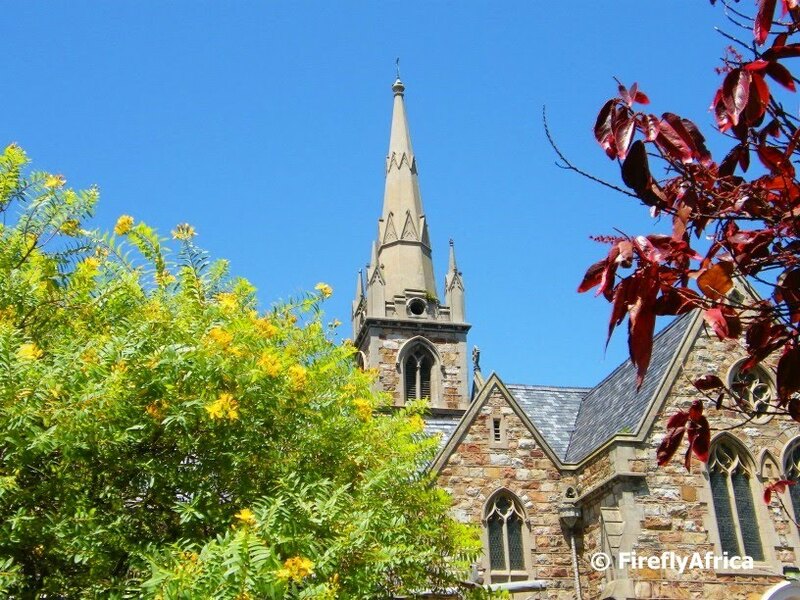 The Anglican Cathedral Church of St Mary the Virgin stands just off Market Square next to the old Public Library in Port Elizabeth. 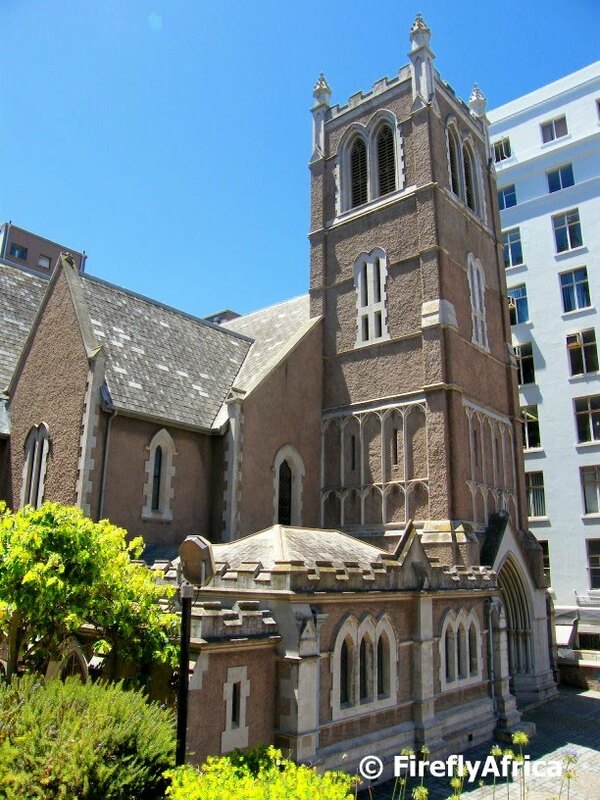 The church's foundation stone was laid in 1825 and it was finally opened in 1832. In 1895 the building was gutted by fire, but it was quickly rebuilt with money donated from people as diverse as the Cape Prime Minister, Cecil Rhodes and President Paul Kruger of the Transvaal. This photograph was taken from Shark Rock Pier at Hobie Beach looking towards town. 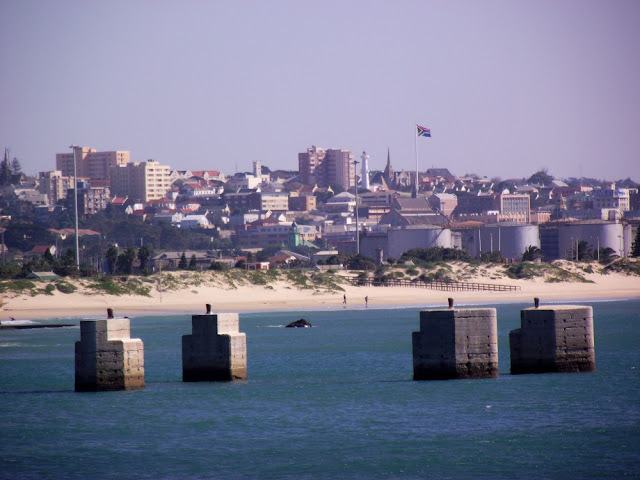 I didn't take it to show a different angle of the old slipway at Humewood , although it is, but rather to show the Port Elizabeth skyline with the new giant South African flag on the Donkin Reserve which I featured in a post last week. When you visit a number of the Big 5 game reserves north-east of Port Elizabeth, one can still see what used to be the old wagon trail that lead from Port Elizabeth to Grahamstown. 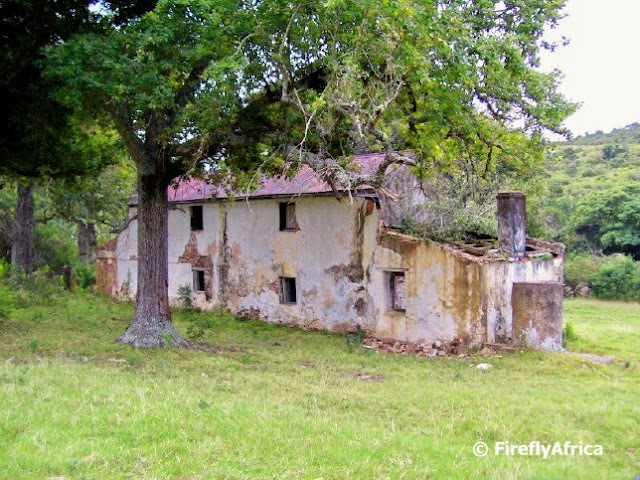 At Kwantu Game Reserve the remains of one of the old wagon trail inns are still visible in one of the valleys. Looking at the ruins it must have been a very popular spot and quite a magnificent building in the early days. If I owned the land, I would probably have turned the site into a lodge using the ruin as the main building. Looking back at the point at Cape Recife from one of the view points on Marine Drive. The lighthouse is visible on the left and the reef runs out for a couple of kilometres from the rocky coastline on the right. 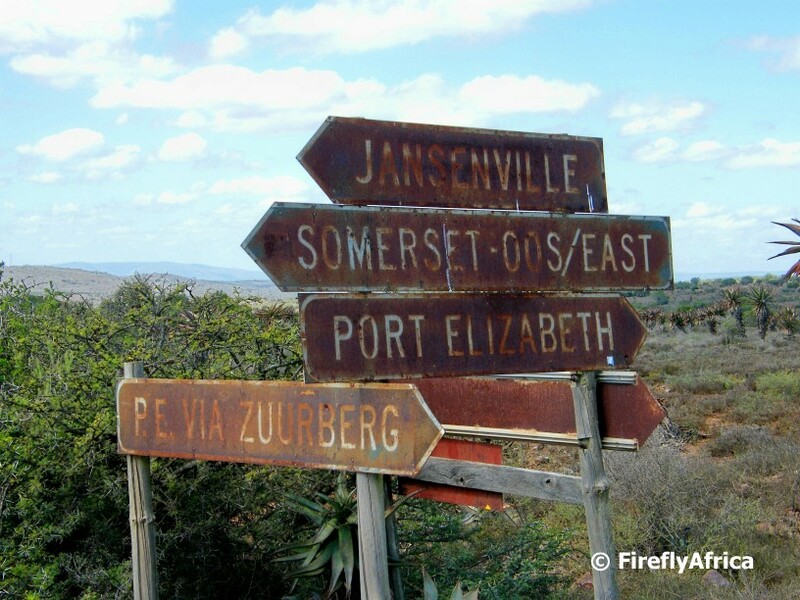 I encountered this rusty old road sign on the dirt road just over the Zuurberg north of Port Elizabeth. 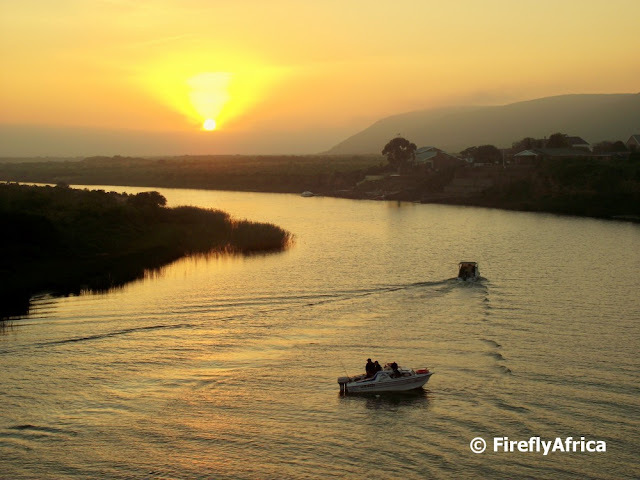 It stands on an intersection on the R400 / R335 dirt roads and directs you to Port Elizabeth via the old Zuurberg Pass which used to be the main road between Port Elizabeth and the interior or via the N10 over the Olifantskop Pass. Every now and then I get a request via e-mail from people who used to live in Port Elizabeth asking me to take a photo of a spot that holds a significant place in their memories. I have to be honest and say that I haven't really made lots of effort to go out and look for those places, but that is now changing. Over the last week or so I have spent my lunch hours looking for places and graves all over PE and these photos I will be posting from time to time. I received e-mails from Darin and Mike within days of each other both asking me to post a pic of a spot at the end of Mill Park Road in Mill Park. Both said that the spot was the ideal place to just sit and wind down after a hard day. 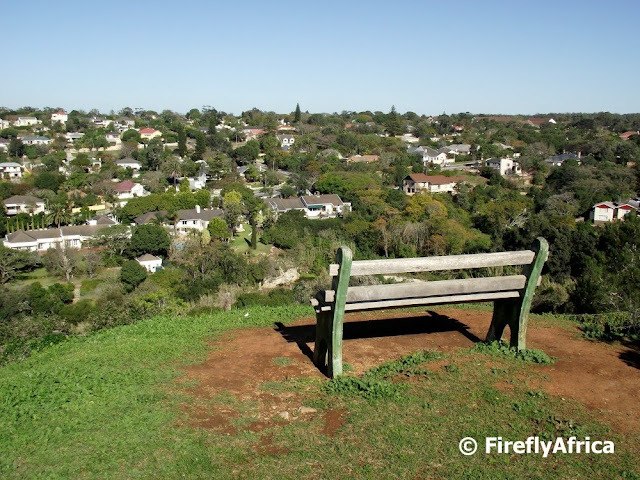 The view from the bench takes in the Baakens Valley with Walmer on the other side. Today is Friday the 13th, so I decided to post something haunting. One of the reminisces of old South End are what is know as the Black Steps. 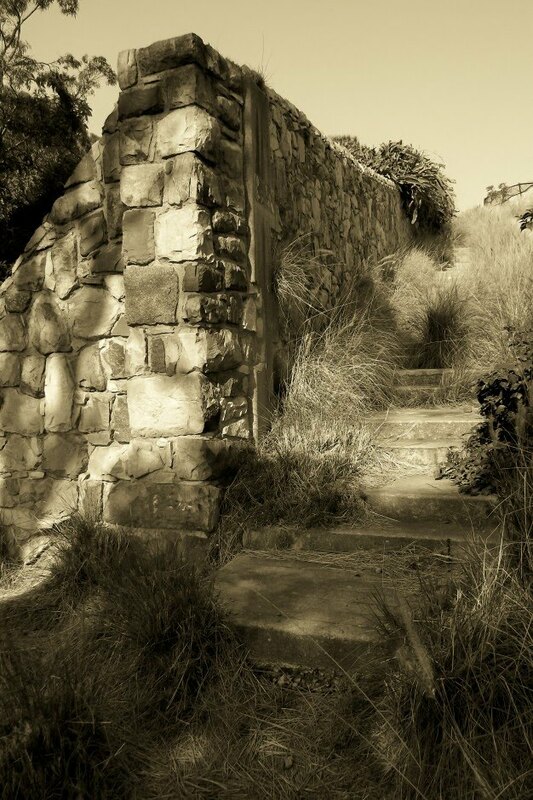 The steps lead up from the Baakens Valley into South End and passes the back of the historic St Mary's Cemetery. The people using the steps have always believed that they were haunted because of its close proximity to the cemetery. The Nelson Mandela Bay Municipality is busy upgrading the Donkin Reserve and one of the main features of the "new" Donkin Reserve is the biggest South African flag in the world. The flag is 12 meters by 8 meters and flies at the top of a flag pole that towers over the Donkin Lighthouse. 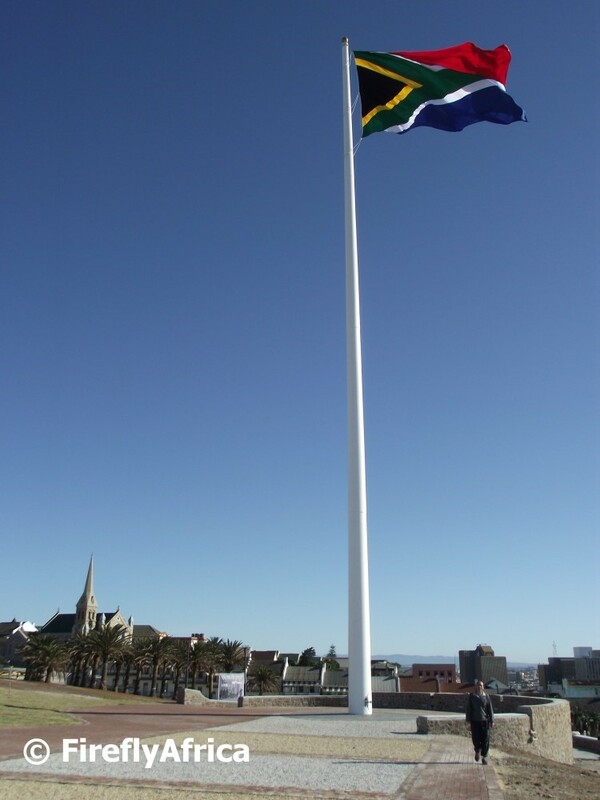 The flag is even visible from the Port Elizabeth beachfront and is set to become a prominent part of the PE skyline. One of the most undiscovered historical parts of Port Elizabeth must be in Bethelsdorp. 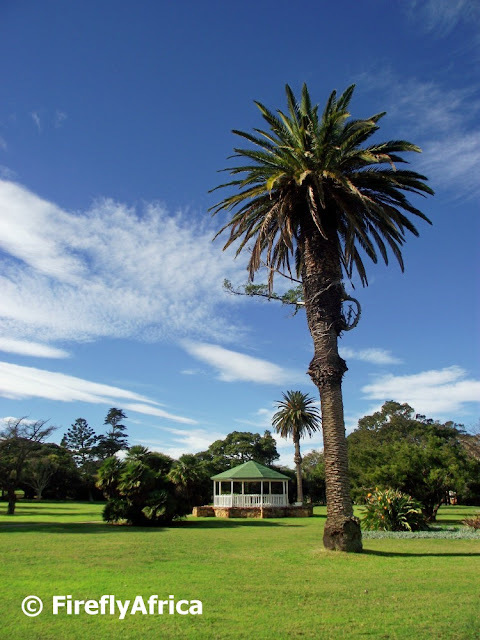 Bethelsdorp Village was established in 1803 by a missionary, Dr Johannes Van Der Kemp. The old section of Bethelsdorp contains a number of historic buildings with the Van Der Kemps Memorial Church (United Congregational Church) taken centre stage. Originally built in 1803 it was destroyed by fire in 1890, rebuilt in 1903 and again in 1926 and extended in 1985. I went to the South End Cemetery the other day to look up a couple of graves. 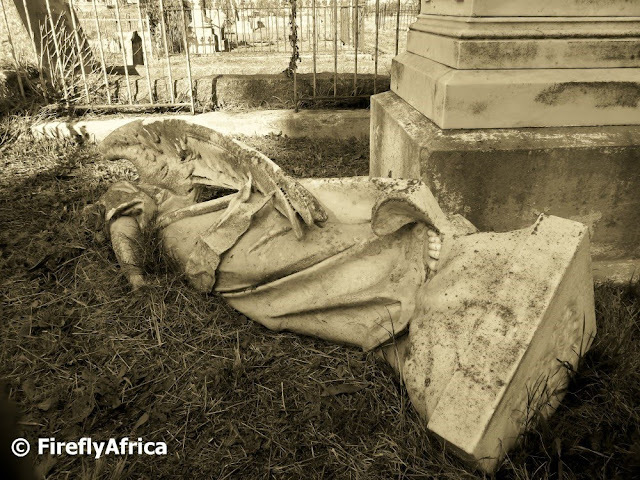 In the old part of the grave yard I found this angel statue that has fallen over which tickled me and my camera's fancy. 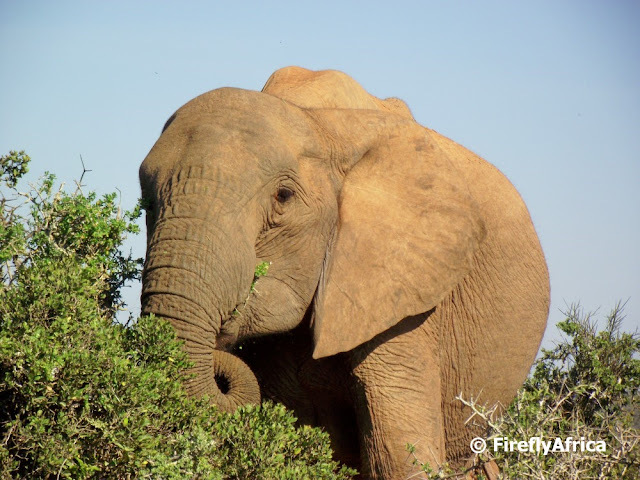 Today (9 August) is National Women's Day here in South Africa and I would like to pay tribute to women everywhere by posting a picture of a female elephant. Confused? Don't be. Elephant family groups are lead by matriarchs. What they say goes and they lead by example. I have even seen them "tell off" the big adult bulls when they join up with the breeding herds and, believe me, that must take something. So here's to the women in our lives. Our wives (or girlfriends) and mothers, sisters and grandmothers. Respect. 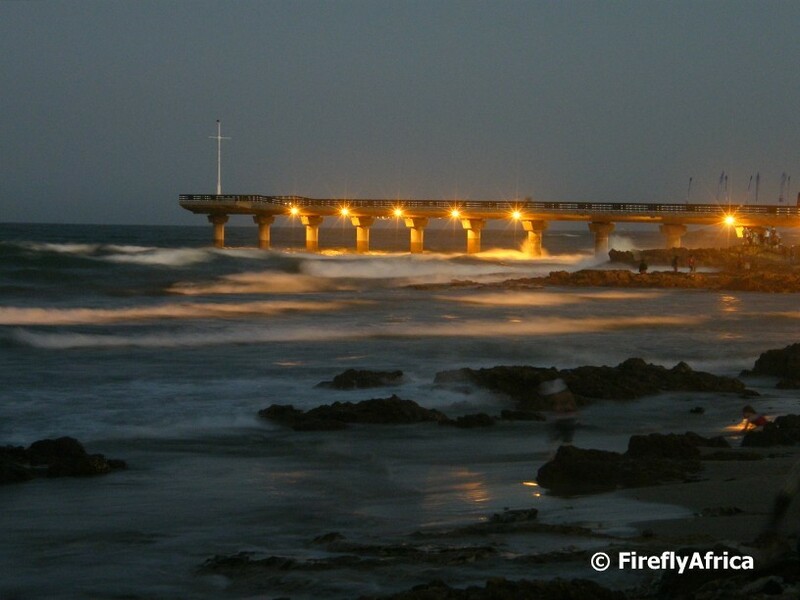 Shark Rock Pier seen from the Humewood Beach side in the early evening with its lights (well, some of its lights at least) on. The weather has been stunning over the last couple of weeks and its always such a shame to be stuck in the office on days like this. The other day I popped out for a walk in Victoria Park and it was really a great way to clear the head after a tough morning. In the pic is one of the parks big palm trees with the band stand gazebo in the background. 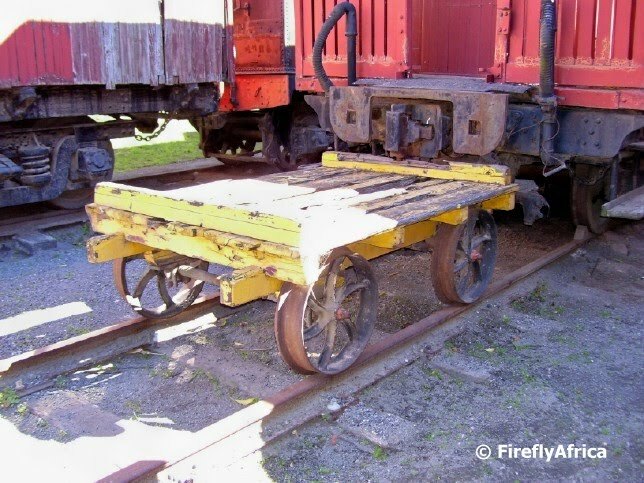 Visitors to the Old Railway Museum in Uitenhage will find an old yellow railway trolley hooked to the rolling stock at the museum. The trolley belonged to James "Jumper" Wide who was a signalman at the Uitenhage Station when the line to Port Elizabeth was established in the late 1800's. Jumper lost both his legs when he slipped and fell under a train. 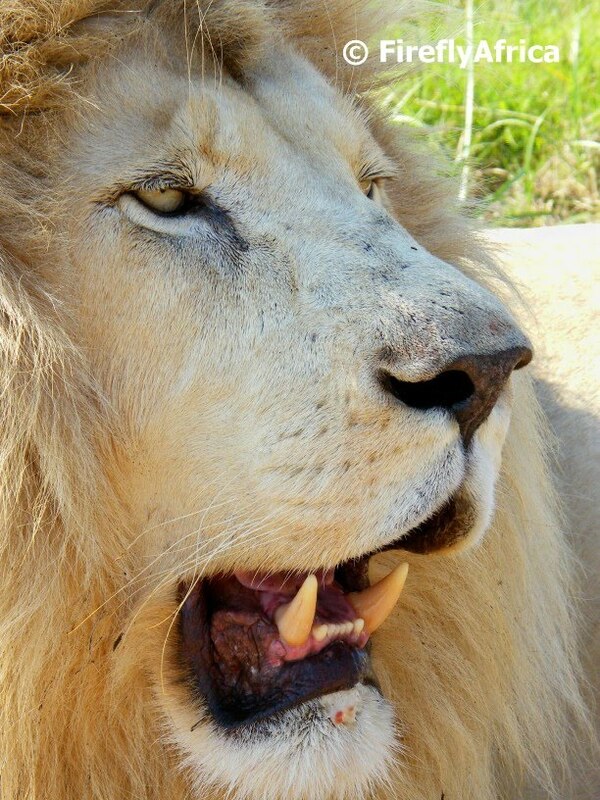 One day he saw a baboon lead a team of oxen into town and Jumper bought the baboon from its owner. He taught Jack the baboon to push him to work on his trolley every day. Jack was a fast learner and Jumper taught him how to work the signals at the station. Jack eventually died in 1890, but his skull is on display in the Albany Museum in Grahamstown and his legacy will live on. Read the whole story of Jack the Signalman. Standing next to the City Hall on Port Elizabeth's Market Square is a replica of the crosses that Bartholomew Dias planted along the coastline on his epic journey in 1488. Dias was the first European to discover the southern point of Africa. He rounded the Cape in a storm and first landed in Mossel Bay, putting up a cross there. His next stop was Algoa Bay where he erected a cross on St Croix Island. From here he sailed as far as Kwaaihoek (see here) near Kenton-on-Sea where he planted another cross before turning back to Portugal. 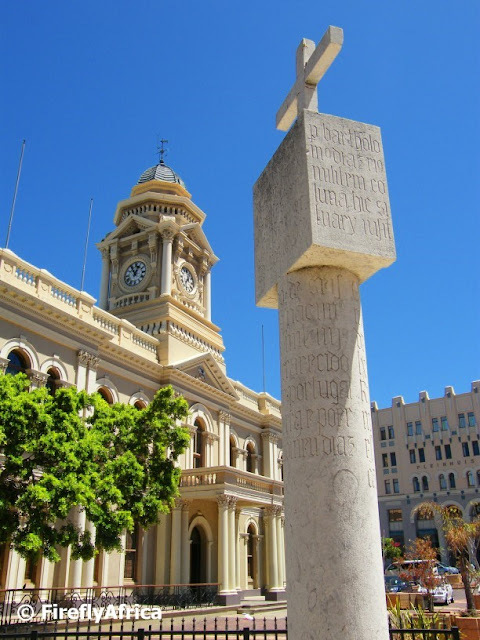 The cross replica at the City Hall was given to the city by the Portuguese government and the stone was actually quarried in the same area where the stone for the original crosses came from. 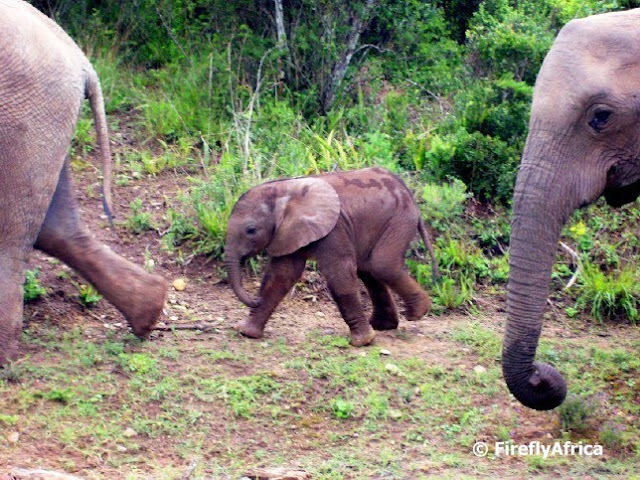 When visitors to Addo Elephant National Park find the elephants they get very excited, but when they find elephants with tiny little babies like this one, they go absolutely gaga. I always find the old slipway at Humewood Beach a very interesting feature on the Port Elizabeth beachfront. 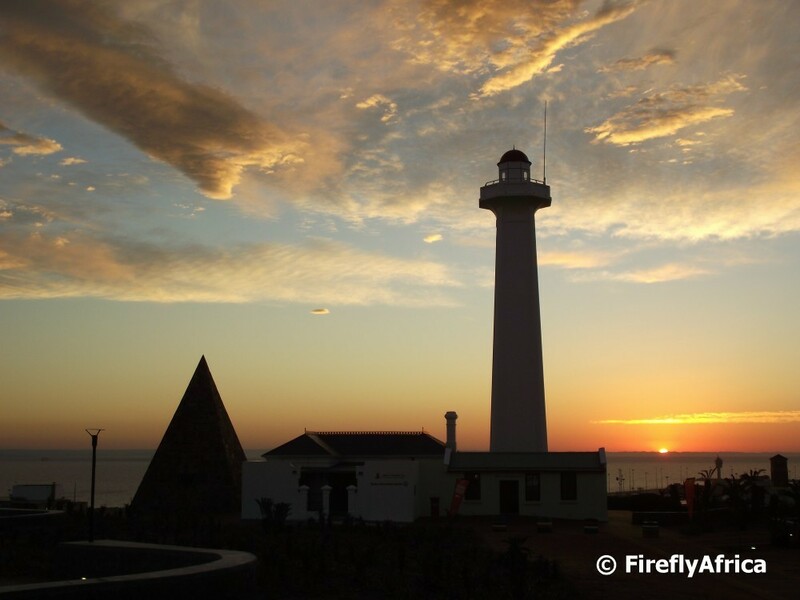 The slipway was used for boat repairs before the PE Harbour was built in the 1930's. Boats sailed in between the pillars before being pulled onto the slipway. Today its a very popular snorkeling spot and used by most dive schools for their students' first dives.